Made in Sydney, New South Wales, Australia, 1922. On the 21 September 1922 an eclipse of the sun passed across the centre of Australia providing optimum conditions for observations. This photograph was taken by one of the members of the Wallal Eclipse expedition in Western Australia. 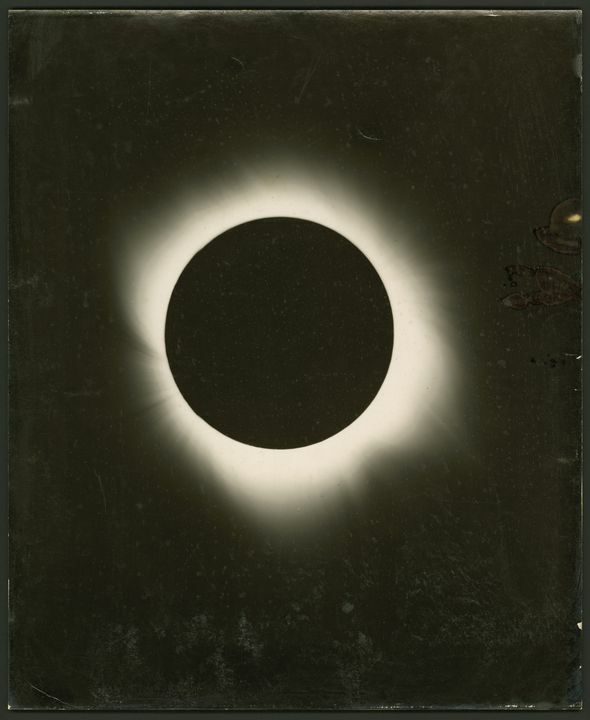 A black and white photograph of an eclipse. The photograph and is framed in a black rectangular wooden frame. There is a metal plaque adhered to the glass at the bottom of the frame. There are two metal eye hooks on the back of the frame and a length of string attached to the hooks. Engraved text on plaque reads '1922 SEPT 21 / LICK 40 FT CORONAGRAPH'.